In Chinese thought “Breath” means vital impulse, primary energy. This is what the MNAAG offers you to discover while you contemplate six recent paintings by the artist Jiang Dahai. Inside the alcove formed by the rotunda on the fourth floor of the museum, the meditative dimension of the dome entirely opens up, allowing to fully appreciate the artist’s work. At once silent and spatial, wavy and vertical, Jiang Dahai’s painting constantly intrigues and astonishes. The opportunity to come and watch the painter in the midst of his creation is all the more exceptional! Born in Nanjing in 1946, Jiang Dahai was successively trained at the China Central Academy of Fine Arts in Beijing and the Beaux-Arts in Paris. This dual influence gave rise to a pictorial style borrowing from both Chinese landscape painting and Western abstraction. Heir to Zao Wou-ki and Chu Teh-Chun who also trod the streets of Paris, Jiang Dahai extends and renews the dialogue between our two cultures. 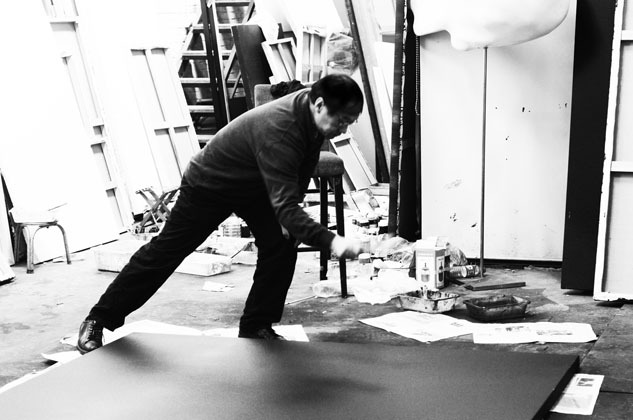 Backed up by an intimate knowledge of French art (Corot, Degas, Cézanne), but foreign art as well (Rothko and Morandi), Jiang Dahai makes us see Chinese and French painting traditions in an entirely new way. From the simplest of techniques – the drop falling off the Chinese brush – the painter developed his own pictorial method, out of which spring immense sky landscapes where the motif of cloud and mist are reinterpreted. The beholder’s eye is invited to wander everywhere, and everywhere the work’s infinite chromatism astounds us. Guided by the utmost concentration, at once random and purposeful, Jiang Dahai’s painting is illuminated by the minimal density of his gesture. To be able to follow it in every aspect and, like observing the potter who effortlessly creates a masterpiece out of a piece of clay erasing the very notion of difficulty, you will be able to measure the refinement of the artist’s practice while watching the artist paint before your very eyes.